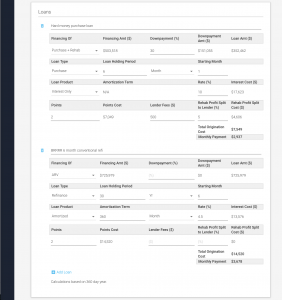 After months of feedback from our customers, and the resulting product development, and improvements, I’m proud to announce the release of our latest features catering to buy and hold investors who buy and improve distressed properties for long-term cash flow. Whereas the original focus of the software was purely to support fix-and-flip investors, the overwhelming feedback from our customers, and the current trends in investing are to purchase distressed properties and improve them as part of a long term buy and hold strategy. To that end, the software not only continues to be the best in breed for in-depth analysis of the purchase, and fix and flip strategy of properties; it now supports in-depth analysis of long term cash flow properties, that may benefit from initial improvements, from single-family residences, to duplexes, and even multi-family complexes. With the ability to input variable amortization periods, loan starting, and holding times, investors can model a wide variety of financing needs for each phase of the project. This can, for example, be used for investment strategies such as BRRRR (Buy, Rehab, Rent, Refinance, Repeat) with the ability for any number of purchase, rehab, and refinancing combinations. Choose to enter a single monthly income number, or break it down into any number of units (or groups of units) and supplementary income streams. Similarly, configure vacancies project-wide, or by income stream for flexibility in modeling your strategies. For example, while House Hacking you can indicate that one unit is 100% occupied. 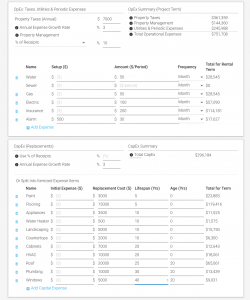 List and keep track of all of your OpEx, and CapEx in a variety of ways (as a percentage of income, or by system age, cost, and lifespan) giving you the ability to model your annual impact on cash flow. 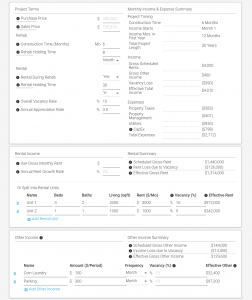 Just like the flip analysis, your rental analysis is also marketable to other investors or for funding purposes in a shareable report where you have control in the metrics to share. To do this right, nearly 20,000 lines of code were touched which included significant performance improvements in the detailed rehab cost estimate, as well as marketing reports sections. Even if you have comps, do you really know what that property is really worth? Do you know if you should flip it or keep it? For how long should you keep it? Based on what you know about the property’s condition, do you know that on year X your expenses will kill your cash flow? 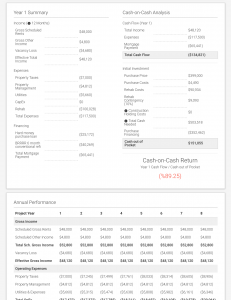 Will you ever be cash flow positive? If not, will appreciation make up for it? Not knowing any one of these questions can end up costing thousands, which is why it was so important to build it into the software before the public availability release. So, with all this value now in place, we will be focusing on publicly launching the software out of Early Access. Further details on release timing and pricing will be forthcoming soon. If you have yet to decide if REI/kit is for you, I would encourage you to sign up for a free trial to lock in the ridiculously low Early Access pricing now before it goes up. You won’t be able to get this pricing again after the launch, and if it’s not for you, you can always cancel within the generous trial period, and not get charged. Start your free trial and make your deals more profitable! As always, this is just the beginning, as we continue to evolve the software to help our customers grow their real-estate investment businesses.